still in the 80s! Therefore, leaves are just beginning to turn to their oranges, reds, and yellows (yes, we have all four seasons here!). I am really ready to wear a sweater, make a fire in the fireplace, and cook some stew. Fortunately, the cool temperature is now here! featuring Good Vibrations band, and at Harbor Club (for the Greene County Boys and Girls Club) featuring the Sensational Sounds of Motown. Whew, we’re tired of dancing! The Catholic Knights of Columbus men sold Tootsie Rolls candy at the intersection on Highway 44! Lake Oconee charities surely got a monetary shot in the arm this season. Fall brings in Football season, an eagerly anticipated time is finally here. Many Lake Oconee fans drove to Atlanta to attend the Falcons’ first game in the new Mercedes-Benz Stadium. Many University of Georgia fans and Georgia Tech fans pass through the Lake area on their way to tailgating before games. The fans’ car window flags are whipping in the breeze as people travel to their favorite college football game. Young children and grown children are creating new costumes as Halloween approaches. Some churches host Trunk or Treat or parties for the very young goblins, and many adults head for costume parties, also. October and November. People who see it are abuzz about some of the brightly colored modern accessories and the bathtub in the shower! Come see it for yourself. town with a deer carcass strapped to the roof! Men dressed in camouflage were seen at stores buying coffee and canned beans for sustenance. turkey buying frenzy begins. Many families gather for Thanksgiving at their family’s Lake Oconee home. Pumpkins, chrysanthemums, and corn sheaves decorate front porches. At our house, Thanksgiving is celebrated with a Southern favorite, fried turkey! Jim fries two (one is mustard coated) and has been the Hudson family favorite for the past 15 years. The season for buying and selling homes has also been fast-paced this Fall! Come visit and find your four-season home at Lake Oconee. It is a great place to live all year. Outsiders are sometimes confused when we realtors refer to the Lake Oconee Area; is it a town? how do I search for it? Let me explain: The Georgia Power Company created Lake Oconee in 1979 by the building of Wallace Dam. The lake encompasses over 374 miles of shoreline that touches on basically three counties: Greene, Morgan, and Putnam, in Middle Georgia. Greene is to the east of the lake, the main town is Greensboro. Morgan borders the west side of the lake, the main town being Madison. Putnam is on the south side, about a third of the way down, and includes the town of Eatonton. Interstate I-20 bisects the area and connects with Atlanta to the west, and Augusta to the east. Many of the lake gated communities are in the area south of Greensboro, and north of Eatonton. All three counties’ homes for sale are compiled into our local Multiple Listing Service (MLS) to which all REALTORS have access. Information for a quick search, Zip Codes of the three counties are Greene-30642, Putnam-31024, and Morgan-30650. For immediate access to the local MLS, check with Look @ Lake Oconee home site. October is Breast Cancer month all over the country. Lake Oconee women join in raising the awareness of breast cancer by urging tests for early detection of breast cancer, and collecting funds for research to combat this disease which strikes mostly women. Many women may be unaware of screening, or forget to make it a part of their busy lives. Several events for Pink Ribbon month to call attention to this deadly disease will be held in the Lake Oconee area. In addition to efforts planned by churches and civic clubs, the ladies’ golf associations are planning golf fund-raisers to benefit cancer charities. The Reynolds Plantation Ladies Golf Association is planning a special golf day to create awareness of the threat of breast cancer, and to raise money for the research to cure the cancers. Tuesday, October 14th is the day that the Reynolds Pink Ribbon Tournament will take place. Organizers will use the sale of remembrance tee signs, raffle tickets, and other fees to raise money to donate to the American Cancer Society. Thursday, October 16th is the day for the Harbor Club Ladies Golf Association’s annual Pink Ribbon Tournament. Members and many outside players will play at Harbor Club and participate in collecting money to be donated to the Lydia Project. Raffle items donated by local businesses and individuals will be purchased by a ticket drawing after the festive lunch. Pink balloons will be set free in honor of those who lost their lives, and those who have survived women’s cancer. Lake Oconee residents will join people all over the country during the month of October by wearing the Pink. This is an example of how the Lake Oconee LIfestyle is to donate time and money to charities. Join the Lake Oconee Ladies in honoring those affected by women’s cancer, and contributing to charities that try to conquer the disease that is part of so many lives. Join this lifestyle here at Lake Oconee in which people often give back with time and money to help others. For more information, call Suzie (706-347-1115) or Jim Hudson (706-453-6253) with RE/MAX Lake Oconee. We have the key to all the homes listed in our Multiple Listing Service. What Happens to Lake Oconee Home Sales During Recent Shutdown? Worried About Loans as the Government Shuts Down? Government Shutdown…What happens to my FHA closing Tuesday? Let’s pretend that it does not matter which side of the aisle you are on. This is not left or right, red or blue, democrat or republican. This is our collective government and I keep hearing both sides say this is what the people want. What the people want is for those elected to show up at work and do your job. What the people want is to not be told what they want. Grow up, shut up, and show up at work to do what you were elected to do. Keep the government running! As my blog is primarily a real estate/mortgage message I take this opportunity to make you aware of what is possible in a shutdown means to real estate agents and their clients. Fortunately while 90% of all loans are backed by the federal government a great portion of those are backed by Fannie Mae and Freddie Mac and while those two entities are government-run they are funded from the fees they charge. Unfortunately The FHA does not work the same way and while the number of FHA loans have fallen off recently the FHA accounts for a large percentage of the loans currently being processed (roughly 60,000 per month). During a shutdown the FHA will be unable to insure loans and their staff will be unavailable to underwrite and/or approve new loans. According to HUD in the event of a shutdown only 350 of the 9,300 employees would be available to work. This so called economic recovery is being pushed (not pulled) by a small housing recovery. Maybe, just maybe we could stop pointing fingers and laying blame based on party affiliation and not snuff out the small flame by delaying closings on FHA loans in the coming week. Actually, this is a great time to buy at Lake Oconee if you qualify for a loan! Sellers whose homes have been on the market for a while and have not sold, are reducing the prices to initiate a quick sale. The loan rates are still low. Below are links to our listings that have been reduced. Click on the address to see their details. For more information, call Suzie (706-347-1115) or Jim Hudson (706-453-6253) with RE/MAX Lake Oconee. We have the key to all the homes listed in our Multiple Listing Service. Just announced, big news for Lake Oconee! MetLife plans to buy Reynolds Plantation. Below is the press release. ATLANTA, May 09, 2012 (BUSINESS WIRE) — MetLife announced today that it has entered into an agreement to purchase Georgia’s premier golf and resort community, Reynolds Plantation, located on Lake Oconee, 70 miles east of Atlanta. The acquisition will include The Ritz-Carlton Lodge, six championship golf courses, four full-service marinas and nearly 5,000 acres of undeveloped golf and waterfront property. The transaction is anticipated to close during the summer, subject to customary closing conditions. Terms were not disclosed. MetLife is engaging Daniel Corporation to oversee all day-to-day operations at Reynolds Plantation. The Daniel team will work in cooperation with MetLife’s Atlanta Regional Office, headed up by Regional Director Tom Coakley. The Atlanta office manages the company’s real estate investments in the southeastern United States. The collaboration between MetLife and Daniel represents a continuation of a 25-year relationship between the two companies. Their projects include joint venture ownership of 12th & Midtown, a multi-block development along Atlanta’s storied Peachtree Street, which includes the 717,000-square foot 1075 Peachtree office tower and the Loews Atlanta Hotel. Ritz-Carlton will continue to manage the hotel under its long-term management agreement. MetLife has a long history of investing in real estate in Atlanta and the southeastern United States. The company’s current investments — in addition to 12th & Midtown — include Georgia Pacific Center, Georgia 400 Center and Rocca Apartments. Reynolds Plantation, located between Atlanta and Augusta, Ga., is situated along more than 374 miles of Lake Oconee shoreline and features six championship golf courses, dining, swimming pools, pedestrian trails, marinas, a tennis center and a wellness campus. Reynolds Plantation is also home to The Ritz-Carlton Lodge, a 251-room lakefront resort and spa, which was named as a 2012 AAA Five Diamond Lodging and 2011 Forbes Four-Star resort. The community is located about an hour and a half from Atlanta’s Hartsfield-Jackson International Airport. For more information, visit www.reynoldsplantation.com . There are some “real deals” in the Harbor Ridge section of the Lake Oconee golf community of Harbor Club. My husband and I are experts here, as we have been residents of the Harbor Ridge Neighborhood since 2006. I have referenced the community feel of the Harbor Ridge Neighborhood in a previous post, and extolled the special benefits of Harbor Club residency; owning one’s own golf cart, and having 80% home owners as full-time residents. Harbor Ridge is a convenient, friendly, secure neighborhood with well-built, attractive houses. One of the best-ever homes is now for sale at a wonderful price of $449,000.00! The present owners are ready to move, so priced the home really low, considering the square footage, and the added extras. 1160 Harbor Ridge Drive is 4630 square feet of living space distributed over three levels. The terrace level is perfect for teens or in-laws with its own great room, kitchenette, and bedroom suite. This great room has extraordinary 12′ ceilings, lots of sunlight floods in. An extensive sound system makes the whole house perfect for enjoying music, or a sports event on that wide-screened television. The view from the entry-level porch includes the challenging last three holes (my husband calls “the gauntlet”) of the Weiskopf-Morrish designed Harbor Club Golf Course. Masters, at Lake Oconee? Did you think that the Masters Golf Tournament was in Augusta, Georgia? Of course it is, but the Lake Oconee area, only about 80 miles to the west on Interstate 20, is hopping during Masters Week, too! Many Masters patrons enjoy staying in the lake area to avoid the congested traffic, crowded restaurants, high prices in the Augusta area during the week of the Masters Golf Tournament. 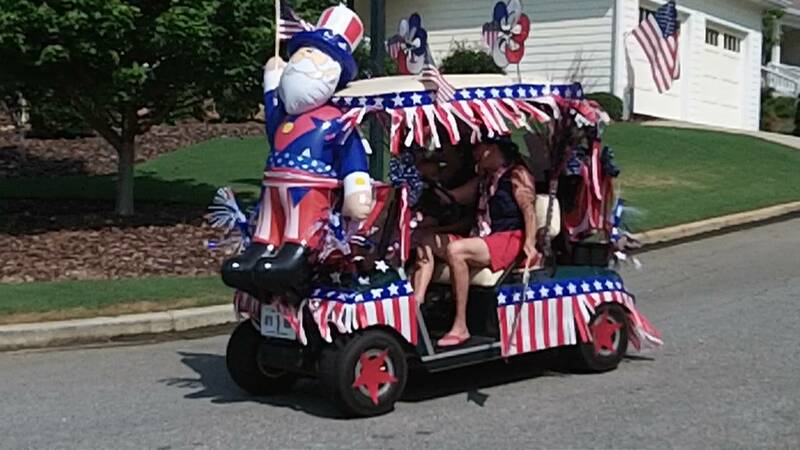 Many golf lovers combine attendance at the tournament for a half day of watching golf, with a half day of playing their own golf at Lake Oconee. If one enters I-20 at Greensboro, it is an express-way drive to the famous Washington Road exit near Augusta National Golf Course, home of the Masters Golf Tournament. For weeks the Lake Oconee community has been preparing for Masters Week ( and Spring) by putting down mulch, pruning the shrubbery, and repainting the trim on businesses and homes. The golf communities have been reserving tee times and rental properties for the Masters Patrons. Around Lake Oconee, new businesses are planning to open “at least by Masters Week”. Restaurants are preparing for peak numbers of customers, and extending their hours during the week of the tournament. The “rebirth” of our grass, azaleas, dogwoods, and other spring bloomers echoes the gorgeous landscapes that always put on a show at the Masters Golf Tournament. This year Masters Week coincides with Easter Week, and many spring breaks from schools, as it often does. Of course, these holidays also bring more people to the Lake Oconee Area. We full-time residents will be entertaining extra guests during this week. Even we Realtors® are expecting increased contacts from people who observe the beauty of Lake Oconee from visiting here during Masters Week. If you are in the Lake Oconee Area this spring, please call us to tell you about the many homes for sale, and the pleasures of the Lake Oconee Lifestyle. This spring, there is not only the resurgence of green plants here, but also the resurgence of the economy and activities that make Lake Oconee such a wonderful place in which to live! Don’t wait to join the many happy home owners at Lake Oconee. Call Suzie (706-347-1115) or Jim Hudson (706-453-6253) for more information about homes in the Lake Oconee area. Go to our website, RE/MAX LakeOconee.com to search ALL the properties on the local market. We have seen a “resurgence” of home buying, too, so if you are interested in a Lake Oconee home, come soon! As we babyboomers enter retirement age, a large number of individuals are making choices of a location to spend their “golden years”. Some people plan to remain in the same community in which they have settled and raised their families. Many people hope to relocate to a warmer climate for their post-career years. Lake Oconee is a good choice for a retirement home. A unique retirement community lifestyle is offered in what is called a 55+ community, one which offers homes with less size and upkeep, coupled with easy opportunities for activities and new friendships. The choice of a 55+ community in the Lake Oconee area is Del Webb at Lake Oconee. This type of community has been described as “trading extra space for carefree living”. The “carefree” part is due to the fact that one fee per month takes care of lawn care, club dues, and POA fees. Many locals have moved to this community from the larger, single family gated communities, and love the “lock and leave” aspect of Del Webb when the urge comes to travel. Located only 75 miles east of Atlanta, Del Webb at Lake Oconee is the only Del Webb community with direct lake access. The community boat ramp affords lake access to residents, and a choice of day docks for temporary use. A 21,000 square-foot recreation center includes indoor resources such as pool, ballroom, fitness center, billiards room, arts and crafts room, and game rooms. In addition, there are exciting outdoor amenities such as tennis pavilion with clay courts, bocce courts, croquet and pickle ball courts. Of course, there is a luxurious outdoor pool, and a beautiful lakeside pavilion for community gatherings. All this comes with a Lifestyle Director who can advise you of activities, clubs, trips and classes to share with other like-minded residents. You can be as busy as you like, it’s up to you! Del Webb community sits on acres of beautifully landscaped hills, many acres left in the natural state, in the heart of the Lake Oconee Area. Just outside the gates there is easy access to restaurants, golf, and entertainment. Jim and I are proud to offer you our newest listing, a 2493 square foot traditional home in Del Webb. This home stands out from the rest in Del Webb with its special upgrades, including many special architectural details, a flagstone patio with built-in grill and storage, and a pergola with a killer view. A large all-season room was added for extra lounging and entertaining space. The location of this property allows for privacy, as well as attractive curb appeal. This wonderful 3 bedroom, 2 bath ranch home is listed by RE/MAX agents Suzie and Jim Hudson for $389,000. For more information about 1101 Water Front Road, Greensboro, GA go to this link at RE/MAX Lake Oconee. For showings or information about any property in the Lake Oconee Area, call Jim 706-453-6253, or Suzie 706-347-1115.